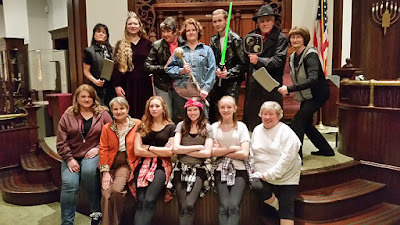 The cast of "You Can't Stop That Spiel" at Temple B'nai Sholom in Huntsville, March 3 to 6. Birmingham will have its first community-wide Purim-Palooza involving the Birmingham Jewish Federation and Foundation, PJ Library, Chabad of Alabama, Collat Jewish Family Services, Knesseth Israel, the Levite Jewish Community Center, N.E. Miles Jewish Day School and Temple Beth-El. Costumes are encouraged. The event starts with a free carnival at 4:30 p.m. on March 23 at the LJCC. Dinner will be available for purchase. At 5 p.m. there will be a Children’s Megillah Storytime for ages 5 and under, facilitated by Chabad and PJ Library. At 5:30 p.m. there will be an egalitarian megillah reading facilitated by Temple Beth-El Rabbis Randall Konigsburg and Joseph Robinson. At 7:30 p.m. there will be a women’s megillah reading with women from the community, and a traditional megillah reading with Rabbi Eytan Yammer. The New Orleans JCC, on the other hand, has been doing this for years. The 47th annual community-wide Purim celebration will be held on March 13 from 11:30 a.m. to 3:30 p.m. at the Uptown JCC. There will be food, music, games and activities for all ages. The inflatables are back, along with the “Human Hamster Balls,” which made their debut last year. Food items include Middle Eastern delicacies and New York-style deli items, snowballs, popcorn and homemade hamantashen, baked by the Young Women of Hadassah in the tradition of the New American Social Club. Admission to the carnival is free and open to the community. A children’s All Day Play Pass is $12, or $10 with a donation of nonperishable items for the Broadmoor Food Pantry. In Huntsville, Temple B’nai Sholom will have three performances of “You Can’t Stop That Spiel.” Director Fred Tamm-Daniels said it is the eighth in a series of “tongue-in-cheek Purim musicals telling the story of Esther through the music of Broadway. The show is done in the style of a local theater production with live accompaniment. The previous show, “Chicago — the Megillah” sold out two of three performances. 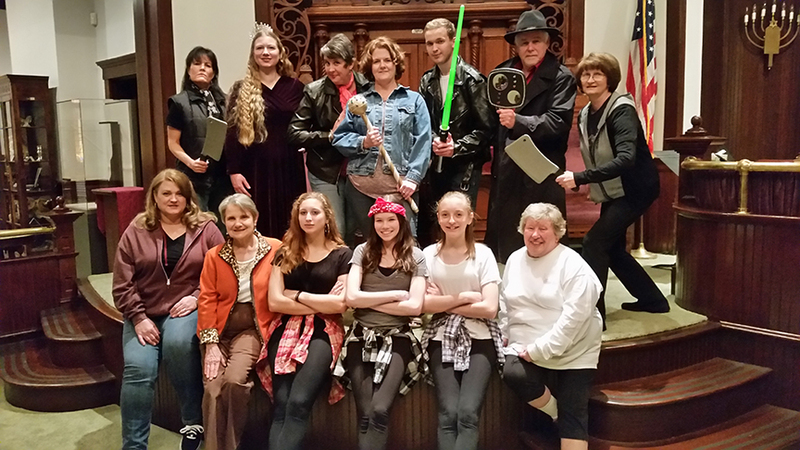 Performances are at B’nai Sholom on March 3, 5 and 6 at 7 p.m. A dessert reception follows on opening night. Tickets are $10 and went on sale on Feb. 10. Auburn Hillel is planning a Purim carnival on March 26 from 5 to 9 p.m. in the Student Center Ballroom, reaching out to all the Multicultural and Diversity organizations at Auburn to help out and each have a carnival booth activity at the event. Birmingham’s Temple Emanu-El will have its Purim Spiel, “The Sounds of Purim,” in the chapel on March 20 at 9:30 a.m., followed by a carnival. The Bais Ariel Chabad Center in Birmingham will have Purim at Alabama, a Purim Tailgate Party, in memory of Shannon Hope Cogen. Costuming will be in favorite team colors. The March 24 event starts with a megillah dedication in Cogen’s memory at 4:15 p.m., followed by the megillah reading and dinner at 5 p.m. There will be barbecue, an open bar, children’s activities and an exotic animal show. Reservations are $18 per person, $10 per child and a family maximum of $54 by March 20; $25 per person, $12 per child and $70 maximum at the door. Chabad and PJ Library are co-sponsoring the Itty Bitty Purim Schpiel, March 6 at the McWane Science Center in Birmingham. Designed for ages 0 to 4, there will be Purim crafts, story time and a snack. There will be free play in the Itty Bitty Magic City at 3 p.m., followed by the Purim program at 4 p.m. and Itty Bitty play at 5 p.m.
You Belong in Birmingham will have a masked Purim party, March 26 at 7 p.m. at The Nest in Avondale. There will be drinks, appetizers, raffle prizes and music. Tickets are $18. Dothan’s Temple Emanu-El will have its Purim potluck on March 25 at 6 p.m., followed by a Purim service at 7 p.m.
Chabad of Huntsville will have a Purim party with a light dinner, spirits, megillah reading and mitzvot, on March 24 at 5 p.m.
Mobile’s Ahavas Chesed will have Pizza and Purim on March 23 at 5:30 p.m., with free pizza for all who come in costume, and a competition for best costume. Springhill Avenue Temple in Mobile will have “Purim: Beach Boys Style” on March 23 at 6 p.m., followed by a free spaghetti dinner. Chabad of Mobile will have Purim in the Stadium, with a Super Bowl winner in attendance. The event will be at Gallery 450 and feature a stadium-style dinner, drinks, hamantaschen, a multi-media megillah reading and guest Alan Veingrad. A member of the Dallas Cowboys in Super Bowl XXVII, he will talk about going from a skinny Jewish kid in Brooklyn to a Super Bowl champion, and his Jewish journey afterward. Admission to the 6:15 p.m. event on March 24 is free though reservations are required, and autographed footballs can be ordered in advance from the Chabad of Mobile website. Agudath Israel-Etz Ahayem and Temple Beth Or will have a joint Montgomery Purim service at AIEA on March 23 at 6 p.m., with a spaghetti dinner, costume parade and contest and megillah reading. Chabad of the Emerald Coast will have its Royal Purim Masquerade Ball on March 24 at 5:30 p.m. at the Chabad Center in Destin. There will be a sushi bar, megillah reading, costumes and music. Beth Shalom in Fort Walton Beach will have its Purim celebration on March 25 at 7:30 p.m.
Chabad of Baton Rouge will host several Purim activities, starting with a megillah reading on March 23 at 7:30 p.m., and a Purim party for Israelis at 9:30 p.m.
On March 24, Chabad of Baton Rouge will host a Purim Extravaganza at the B.R.E.C. Center at Highland Park, from 5 to 7 p.m. There will be a full buffet dinner, magic show, face painting, prizes for all who attend in costume and a megillah reading at 5:15 p.m. Cost is $15 for adults, $8 for children, $40 for a family. Sponsorships are available for $180. B’nai Israel in Baton Rouge will have “One Enchanted Evening” with Persian Purim Platters and Megillah Munching on March 23 at 6 p.m. Persian dishes will be served at the “evening of fun and study.” Reservations are $10. The B’nai Israel religious school’s Purim celebration will be on March 20 at 11 a.m., while the M&Ms group will have its celebration at 10 a.m.
Beth Shalom in Baton Rouge will have its Purim service on March 23 at 7 p.m.
Temple Sinai in Lake Charles will have its Purim family night with Rabbi Barry Weinstein on March 18 at 6 p.m. The joint Purim carnival with Temple Shalom in Lafayette will be on March 20 at Temple Shalom at 9:30 a.m.
B’nai Israel in Monroe will have a Purim service with Rabbi Jeremy Simon from the Institute of Southern Jewish Life, March 18 at 6 p.m., with a dinner to follow. Tot Shabbat Purim carnival will be on March 19 at 9:30 a.m., followed by Jewish American Cuisine at 10:30 a.m.
On March 23, Anshe Sfard in New Orleans will have a Purim Second Line featuring the Panorama Brass Band. The festivities begin with a Megillah reading at 7:30 p.m. Afterward, there will be a reception and music by the Panorama Jazz Band downstairs, with the band and Krewe du Jieux leading the Second Line to The Avenue Pub at roughly 9 p.m. The event has been renamed in memory of Louis "Bicycle Louie" Lederman, the 2015 Post-Humorous King of the Jieuxs. Beth Israel in Metairie will have a Purim Super Heroes Party on March 23 with children’s programming at 7 p.m., ma’ariv with megillah reading at 7:45 p.m. and a Purim celebration at 8:30 p.m. including Breakfast for Dinner. There will also be a megillah reading at morning minyan, 7 a.m. on March 24. Gates of Prayer in Metairie will have Purim pizza, megillah reading and “Purim Wars: The Shpiel Awakens” on March 23 at 6 p.m.
Shir Chadash in Metairie will have its Purim celebration on March 23, beginning with dinner and a costume contest at 6 p.m. and a megillah reading at 7 p.m.
A Muppet Show-themed Purim Shpiel will be at Touro Synagogue in New Orleans on March 20 at 10 a.m. The show will feature actors, singers, pigs, frogs, chickens and dancing bears. Temple Sinai in New Orleans will have its Purim Shpiel, “Esther — The Force Awakens,” on March 23 at 5:45 p.m., featuring Leah Esther, Han Ahashuaras, Yoda Mordecai and more. The Sisterhood Purim dinner will follow. Temple Sinai will also have an adult education mini-course on the Book of Esther, for three Wednesdays at 6 p.m., starting March 2. The course will explore the historical setting and the genealogy of the characters. Chabad Uptown in New Orleans will have a Purim Eve Bash on March 23 at 7:30 p.m., featuring a megillah reading and slideshow, buffet, drinks, music and a children’s program. Chabad will then host Purim in Outer Space, at Torah Academy in Metairie on March 24. The megillah reading will be at 5:30 p.m., with the Purim feast at 6 p.m. Cost is $18 for adults and $10 for children before March 21, higher afterward. Shreveport’s community Purim carnival will be on March 20 at B’nai Zion, starting at 10:30 a.m.
Agudath Achim in Shreveport will have a Purim service on March 23 with a dairy covered dish dinner at 6:15 p.m., followed by the Purim play at 7 p.m. and a megillah reading. The Purim Schpiel at Shreveport’s B’nai Zion will be “Star Wars: The EmPurim Strikes Back/The Return of the JewGuy,” during the March 18 Shabbat service, at 6 p.m.
Greenville’s Hebrew Union Congregation is holding its Purim carnival on March 27 at 11 a.m.
Beth Israel, Gulfport, will have its Purim carnival on March 20 at 10 a.m. and megillah reading with Rabbi Akiva Hall on March 23 at 7:30 p.m.
Chabad of Southern Mississippi will have a Waffle House-themed Purim celebration, with a breakfast feast, crafts, megillah reading and more. The celebration will be March 24 at 5:30 p.m. at the Biloxi Visitors Center. Beth Israel in Jackson will have a Purim carnival and auction at 11:30 a.m. on March 20, benefiting Beth Israel Temple Youth. The Purim celebration for all ages will be March 23 at 7 p.m.